Feed water is chlorinated by Sodium Hypochlorite Solution (NaOCL) so as to maintain residual Free chlorine of 2-3 mg/L. It consists of a solution tank, pump and accessories. Chlorination water is stored in raw water tank. One Dosing Injection Valve (For Installation At The Point Of Dosage). This dosing system is provided to take care of bicarbonates present in water & prevent the Scale formation on membrane. Dosing will be done using electronic metering pump. Antiscalent dosing unit consist of dosing pump, solution tank and standard accessories. Antiscalant is dosed in the feed of the Reverse Osmosis to keep the hardness causing salts in suspension and to avoid precipitation of salts at high pressures. The dosing is done with the help of the dosing tank and dosing pump. 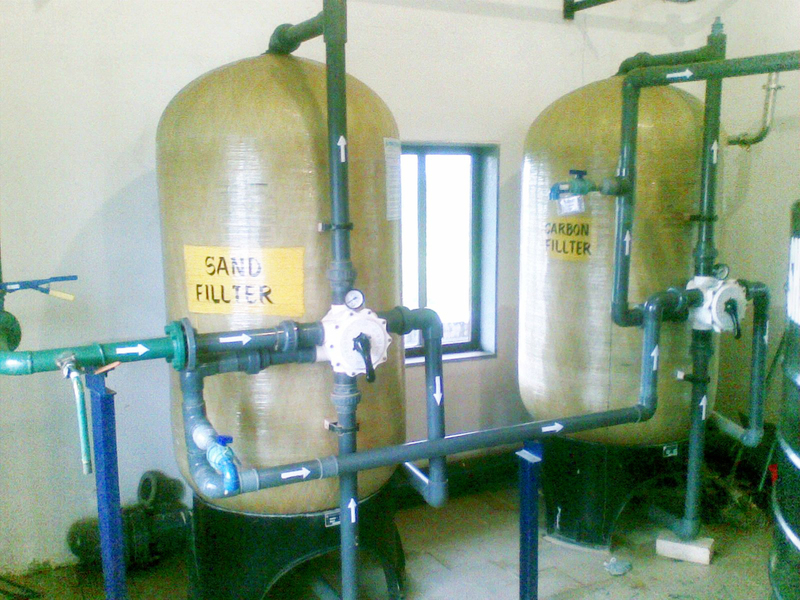 This dosing system is provided to control the scaling of RO membrane due to high amount of silica in raw water. Dosing will be done using electronic metering pump. Antiscalent dosing unit consist of Antiscalent dosing pump and Antiscalent solution tank. The water dosed online with sodium Meta bisulphite dosing for neutralizing the free chlorine present in water. Online ORP analyzer would give the details of the traces of free chlorine if any present in water and would dump the water if any traces found. 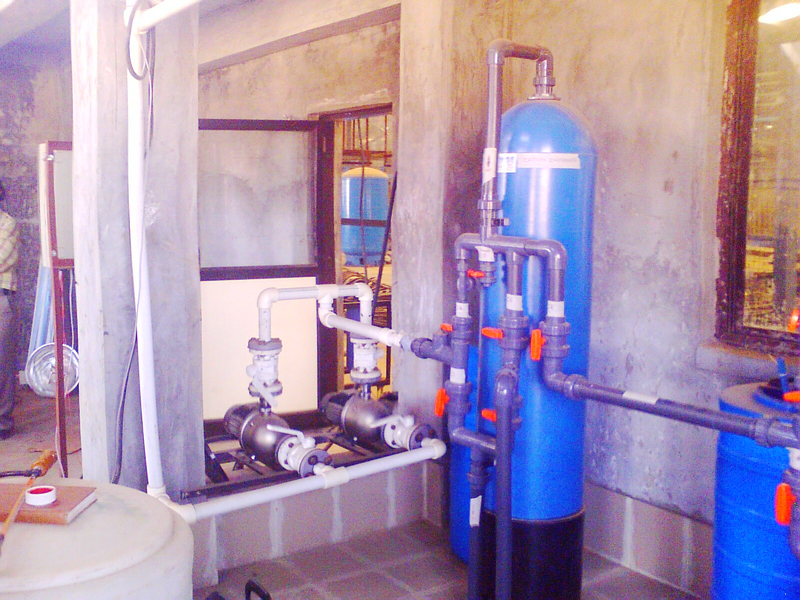 SMBS dosing unit consist of SMBS dosing pump, SMBS solution tank with standard accessories. Before water enters to RO membranes it is very important that all oxidizing agents from water must be removed. SMBS is reducing agent which removes chlorine traces which is left after UF. The Multi grade filter consists of various layers of fine sand, coarse sand, and gravel. Filtered water is then passed through Activated Carbon Filter (ACF) for removal of organic compounds and/or extracting free chlorine from water. The Activated Carbon filter consists of various layers of activated carbon and pebbles. It removes the free chlorine from the raw water. Filtered water is passed through softener. 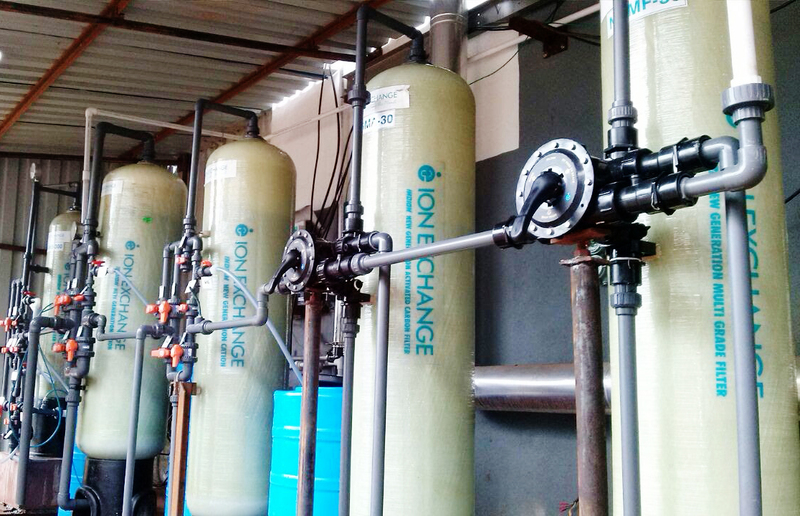 Softener removes hardness by exchanging Ca & Mg ion with Na to produce soft water. Filtered water is then passed through Iron Remover Filter (IRF) removal of inorganic iron from water. The Iron Remover Filter consists of granular media. It can remove dissolved Iron with outlet parameters in range of less than o.3 ppm.